This blog post from JP Rangaswami, a conversation with Mark Little about #cementgate and the weird machinations of my brain are the catalysts for this blog post. 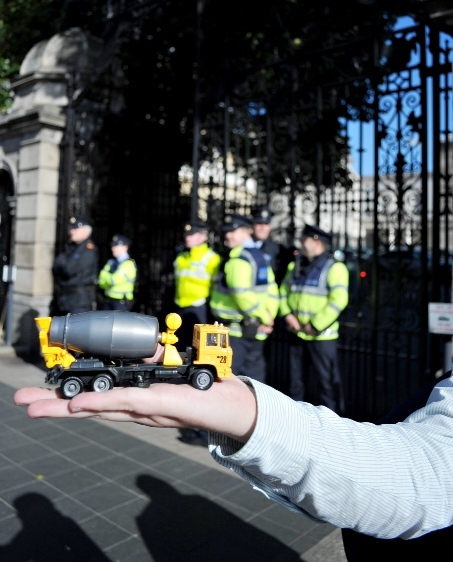 David Maybury tweeted one morning (and I was awake for some reason) about a cement truck parking at the gates of the Dáil as some kind of protest. The “pics or it didn’t happen” brigade including myself kicked in. They took his tweets and retweeted them, sent his pics all around the world and even demanded from news outlets like Morning Ireland and Newstalk what they were doing about the incident. I think it was Morning Ireland that started calling it #truckgate and the crowd told them it was #cementgate, we the public found this news and this is how we are calling it. Do keep up. “We” the masses found the news via David, named it and sent it out and they could be part of it like the rest of us. And the news spread around the world, pushed by the scattered Irish. BBC, CNN and the New York Times all covering it eventually. And calling it #cementgate. In the next few hours the Internet pointed out it was the same truck that was around Galway. That the Gardai had impounded the truck before and they also caught out the liars who said that Gardai had to jump out of the way when the truck rammed the gates. A YouTube video showed the truck slowly drove to the gates and stopped with no cops there to get out of the way. A couple of days later I bumped into Mark Little in Dublin and chatted about what happened that morning. Mark mentioned that maybe David might never report a story like this again but someone like him will. We all have the tools now to do the same, we have a device with a connection to the Internet. The way I see it, we have a connection to people who are more experienced than us who can direct us to do the right/best thing. Take a picture, do a video, this is how you change a tyre, this is how you address a wasp sting. Give us the raw feed and we can do the rest including fact checking while you point or if you have the experience, you can report. Share group memory, shared experience and someone tapping into it. To me David Maybury was being there but he was also being with the elsewhere. He saw the truck, heard the sounds, the background noise, the smell of the ozone from the truck post shut-off perhaps and he was on Twitter responding to people, sharing the imagery and being asked about the event. Twitter for me can add another layer of data and insight into an event I’m at. It can lead me down different paths instead of the regular worn ones. So by describing things, like diarying did years ago but in the new multimedia way and connecting people to it, an event or a building can become more colourful and maybe I become a better observer as a result. So does being digitally connected elsewhere make us appreciate here? So far in 2010 it’s been stop and go and stop stop stop for blog posts here on this website. November is going to be insanely busy with me for work so the blog is going to become very quiet. Just so you know! Unboxing is a big thing in tech review circles now. Buy something and then film it as you unbox it. This is the first recording of a modern unboxing. This is fairly shocking but unsurprising. Use open WiFi, log into sites others have logged in to with ease with Firesheep. Museum for rescued letters. Love it. Lady GaGa and her little monsters can be strong poltical lobbyists. New Irish language blog by cailíní deasa for cailíní deasa and it’s called … Cailín Deas. Science Week which is on 7-14 November this year. Now with web comics! One4all now have an iPhone app. See on your phone where you can spend your vouchers. These sunglasses are either super cool or super fool. Apple have just approved the ‘World Edition’ of Grab Radio. Grab Radio now has over 40,000 stations on board with up to 40% ( 30% on the first release) now streaming with metadata to enable Grabbing and Tagging of music and shows all round the globe. Sticking with the music theme. Tastebuds.fm is a brand new website that matches single people based on their music tastes. Created by two musicians (one from Cambridge, UK and another from Co. Offaly). Phil Collins, bringing people with bland tastes together since 2010. Nice FOI web app. Irish version is deffo wanted. Time lapse footage of the making of the covers for Bill Coleman’s new record ‘You Can’t Buy Back Your Life’. The music is snippets of songs that appear on the album. NAMAland is an augmented reality app which lets you see properties in Dublin owned by NAMA through an iPhone or Android phone. For all of those people that go from Cork to Dublin a lot. Airport codes on a t-shirt. Mini-docu on work desks that people have. I’d watch another 20 minutes on this. October 28th, 2010: Life Skills Workshop For Deaf Teenagers. What we can learn from procrastination. Mad Men, books mentioned or seen in the show. Vid of Paul Delaney who designed a bottle for: Your City, Your Heineken… Cork has a wall painted on Oliver Plunkett Street with the bottle design. Book iPad cover. Book book. Love this. Always recording video camera that sits on your ear, looking where you look. Storyful, The Journal, Broadsheet.ie and now we have Newswhip. Cage match. G’wan. Art and community. Nice simple idea in New York. What does the Like button on your website mean? Stats from Facebook. Got to visit Grianan of Aileach yesterday before heading to Derry Airport via the Bogside. €40 for Limerick City Enterprise Board members. €150 for everyone else. You can book it here. Limerick City Enterprise Board asked me to give you a heads up on the above course that’s on next week. As a member you get the course at a massive discount. Check out the other courses (not done by me) on SEO and LinkedIn too which also come with a big discount. Oi foodies. EnglishMum has an Autumn bakeoff competition. 8 Ways to Sell More Stuff. IIA conference on October 7th on how to sell well online. Includes talk on underwear. Cybercom want to educate graduates and help them get a break in digital. The programme is called Cybercom Exchange. Wine wine wine! New online wine retailer. The Corkscrew. Nixon came to Ireland when President. Did you know that? Radio doc on it. Wicklow TV has now officially launched. Mediabox have booked me to do a “social media” seminar in Donegal on Thursday. And it’ll be with a castle in the backdrop. Glenveagh National Park’s Visitor Centre is where it takes places. Well done to Joanne and crew for putting together the seminar and charging people sfa for it too. Seminar and lunch is €65 and a tour of the castle. And of course I’ll have to try the food at Harry’s. An Irish Food and Drink aggregator.